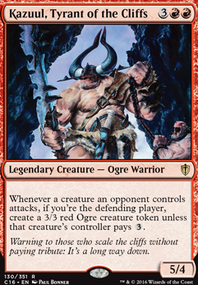 At the end of your turn, if you control a creature with power 5 or greater, you may have Exuberant Firestoker deal 2 damage to target player. Honestly, I don’t think you have nearly enough lands for this deck. I also don’t think you need the alt win con from mayaels aria. 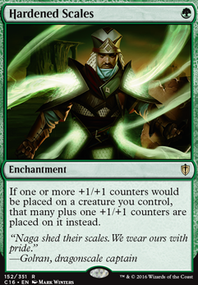 I would pull the aria, wayfarers bauble, darksteel ingot, mordant dragon, flameblast dragon, and zendikar resurgent. Either not good, not necessary, or too expensive. I would as the fetch lands and shock lands. You also don’t have nearly enough creatures. I would pull your overpriced ramp cards and your mana based artifacts and add Draconic Disciple, Drumhunter, Sunseed Nurturer, Exuberant Firestoker, and maybe other mana dorks. Also, replace rain of thorns with Decimate. Cheaper and more destructive. I think it’s a solid base I just don’t see it doing enough as quickly as you want. I took a look on the gatherer searching for cards with the text "power 5 or greater" and found a few cards that I think would be good for dinos. 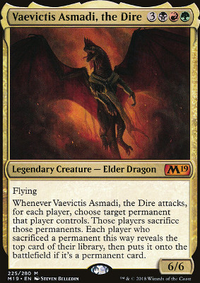 Drumhunter, Exuberant Firestoker, Feed the Clan, Godtracker of Jund, maybe Mayael the Anima, Mayael's Aria, Mighty Emergence, Mycoid Shepherd, maybe Spearbreaker Behemoth, Spellbreaker Behemoth, Sunseed Nurturer, and Where Ancients Tread. Back in the Alara Block, they made a whole bunch of stuff that wanted you to have a creature with power 5 or greater. Things like: Bloodthorn Taunter, Exuberant Firestoker or Mighty Emergence. 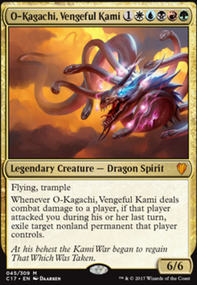 Back in the Tarkir block, they made stuff that wanted a critter with power 4 or greater. 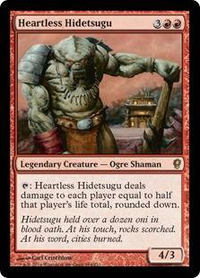 Things like: Wild Slash, Savage Punch, or Temur Battle Rage. I bring this up, because it seems like the Lupine prototype and Avatar of discord are cheap ways to meet these power-conditions. 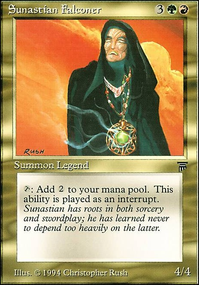 Around the time of Ravnica, there were plenty of cards that wanted you to have no cards in hand. Cards like Jagged Poppet, Keldon Megaliths, Taste for Mayhem. The most recent sets have included Hazoret the Fervent, Neheb, the Worthy and Thresher Lizard, along similar lines as the older Hellbent cards. Other random sets have also included things that allow you to draw cards if you have none in hand: Mindstorm Crown, Sea Gate Wreckage, Idle Thoughts. What's the point of all this? Adding another color would increase the power of the deck considerably. The Jagged Poppet would probably be the most powerful addition, since it survives bolt (and Fatal Push without Revolt), and you may even consider bolting him yourself because you wanted another way to discard your hand, and can generate advantage by making them discard their hand. You might still want to keep your deck monoblack, but I remembered an old card that would be awesome here: Colfenor's Plans. In this deck, it basically gives you a new hand of 7 cards. You're planning to discard your hand, it's not like you'd ever be playing more than 1 spell per turn anyway. I've used them before, they are impressively powerful when they chain into eachother, with one of them exiling another. Anyway...these are things to think about. NIce. May i give you some ideas? Drumhunter and Exuberant Firestoker are mana dorks that also have bonus abilities if you control anything with power bigger than 5, which is pretty easy. Perhaps Exuberant Firestoker? It's a mana dork that occasionally shocks someone. Since you're in red and have a lot of damage, Thornbite Staff might be good to trigger Zirilian an extra time or two. 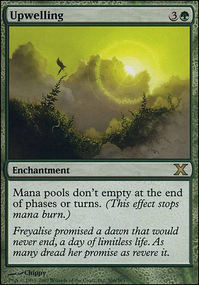 Dangerous Wager is actually great card draw once you empty the rest of your hand(something not hard to do in EDH). Temple of the False God is pretty good too, and Tatsumasa, the Dragon's Fang gives you an equip and a way to spawn a dragon blocker at instant speed. I'm surprised at no Ryusei, the Falling Star- it might kill your general if you sac it but it's a cheap way to wipe an enemy field. 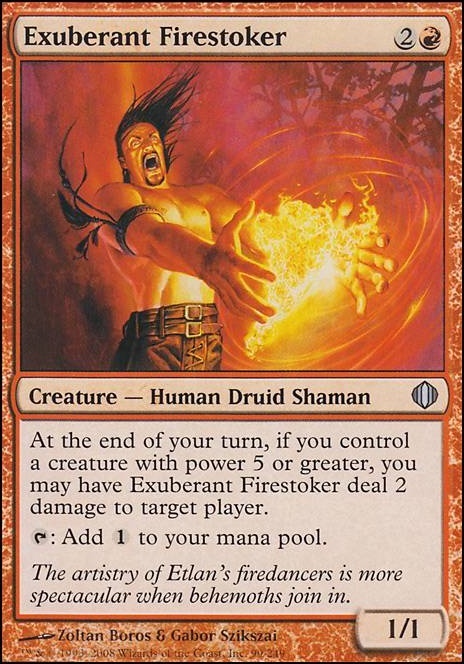 Exuberant Firestoker is a cheap mana rock that shocks people. If you have dragons in your hand you'll enjoy Cryptic Gateway to cheat them out as well. Dragonstorm might be too expensive considering the other ways you have to cheat out dragons but it's worth considering. You don't have a lot of Instants/Sorceries which seems odd when you're in red but having more dragons is always worthwhile I suppose. Either way looks like a fun deck to play!